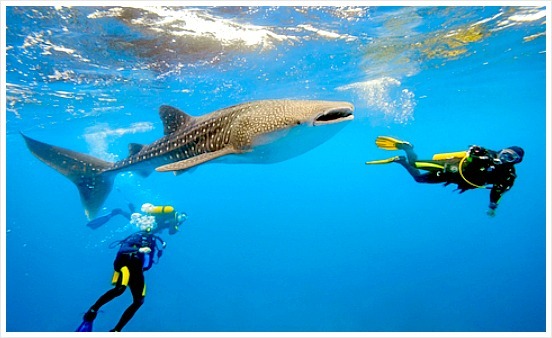 The whale shark in Oslob, Cebu Province is one of the most fascinating attractions on this tropical island. These whale sharks are locally called as "butanding". You can experience and enjoy your close encounter with these creatures in this province if you travel in Tanawan Town down in the southern part of Cebu. The fishermen who became caretakers and operators of this tourism organized the activities for visitors interested in observing or swimming (or even scuba diving) with these huge fishes. The operators, in collaboration with the local government, offers facilities including paddle boats, snorkels, flippers, life vests, diving gears, among others. The Oslob, Cebu whale sharks (Rhincodon typus) are considered as the living species of the 'largest fish in the world'. They can reach up to 15 meters long, but the ones in Tanawan, Cebu are smaller as observed by many, but could also reach that long when they become more mature. Its huge size resembles that of a whale, which exactly explains why they are called as such. The surprising fact about these 'gentle giants' is that they only eats krills (or small shrimps), a fact the counters the common knowledge that bigger creatures usually eat much bigger than shrimps. And, although whale sharks also resemble that of other sharks they are very friendly to humans and other smaller creatures. In other words, they are not as aggressive as the real sharks that we normally know about. That's me struggling to have a photo with the whaleshark behind! I didn't count the teeth because that would be impossible, but marine biologist certainly did that! Click here for my personal encounter with whale sharks in Oslob, Cebu. Just like most of the other species in the world, whale sharks are also listed as endangered species. They are enlisted as such due to some straightforward reasons. One reason is that changes in their breeding behavior and environmental changes affected their whole way of existence. The second and the most reliable reason of their being endangered is that some fishers (businessmen) catch them for money despite the fact that they know their actions are illegal. So, we can hear very sad and horrible stories about these giants being mercilessly caught and and their meat sold. Just as most endangered species suffer from the hands of humans' fight for survival (or greed and selfishness), these gentle whale sharks were fished out and butchered for food and money. They always have fallacious arguments! If you have heard about Cebu, then that's a good starting point. If you are far from this part of the world, you need to get to Cebu via various ways and transports. Given that you are already in Cebu, you have to to go Oslob Town. Oslob is a municipality with around 23,000 residents and is located 117 kilometers southeast of Cebu City. More specifically, Tan-awan (barangay) is where these whale sharks can be seen, which is about 8 kilometers from Oslob Town. Take a taxi, or any transport accessible for you, for South Bus Terminal located along N. Bacalso Avenue. The Ceres Bus fare is Php155 in this writing. You have to let the conductor know that you are getting off at whaleshark briefing center in Tanawan. Go straight ahead to the place (looks like a hall) in Tanawan where the operators hold the etiquette orientation for whale shark watchers (that is you). The orientation is necessary and required by law to help protect these endangered species. The fee for a local Filipino is Php500 which includes snorkel mask, that is, if you really want to swim closer with the whale shark and experience the thrill. However, if you are that scared to swim with it, or probably don't know how to swim, you can just stay safe on the boat and watch or enjoy the view of that marvelous and amazing biggest fish in the world swimming below. 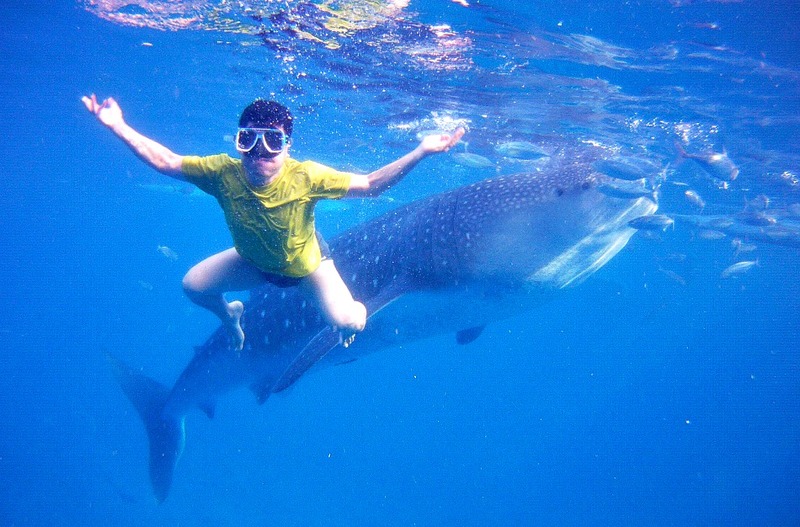 Foreign whale shark watchers will pay Php1000 per head. Warning: Make sure you don't do something against the orientation you have just attended to. Fine of Php2,500 will be given to those who touch or get too close to the wonderful and gentle creature. Aside from just watching these huge fish, the operators in Tan-awan also offer diving facilities if you are interested and skilled to do it. Certainly, you'll have much greater and deeper experience observing and swimming with the sharks. If so, you need to pay the standard rate of Php3,500. Depending on your purpose or budget, you might decide or not to pay that price. However, here's the catch. Since whale sharks are being fed by boatmen, you don't actually need to dive and that is because you can see them fully and their underbellies even if you only snorkel. So, most of the visitors decide just only to snorkel to watch them closely but not too close and feel very satisfied with it. That's the general guide for Cebu whale shark watching in the province. 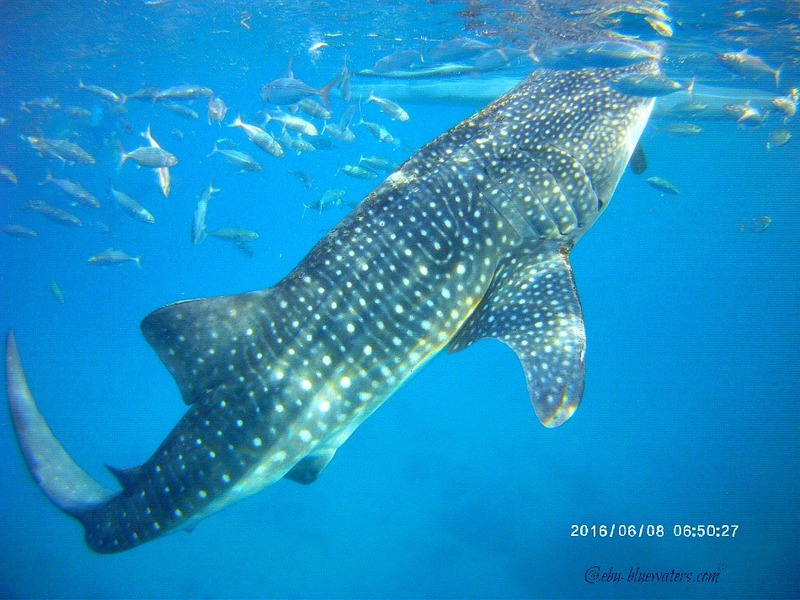 In this site, you can also learn more about whale sharks in other warm sea waters on earth. Happy holiday and enjoyable swimming then!